Around September or October, depending on where you live, you should be thinking of protecting your plants for the winter. During this period many plants succumb to frost, cold or excessively wet soil. The most common approach for protecting plants in planters outside is to wrap them with some kind of insulation. Any insulating material should do the trick. The goal of overwintering most hardy perennials is to prevent them from getting too cold, not to keep them warm. For general protection of your garden apply a layer of bark compost or mulch 5cm (2in) deep around herbaceous perennials but use grit around the plants themselves. This will stop moisture collecting and rotting the stems while the mulch will keep them warm. By rotting down over the winter months the bark will also be adding organic matter to the soil. Tender herbaceous perennials that can be lifted and stored include dahlias, cannas, tuberous begonias and gladioli. All these plants have fleshy tubers, rhizomes (underground stems) or corms that can survive in a dormant state when lifted and stored. Plant bare-rooted roses: Soak the roots in water for an hour. Cut out damaged growth and remove crossing stems. Dig a hole wide enough to hold the roots and deep enough for the bud union to be 2.5cm below ground level. Add compost and a handful of blood, fish and bone. Set the plant in the hole and spread out the roots. Refill the hole and firmthe soil to remove air pockets. Finish this job by early winter, or before the ground becomes too cold. Plan for next year: Order seed catalogues so that when the weather is not suitable for going out into the garden, you can make up a list of crops to purchase for sowing in the new year. 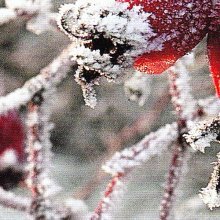 Winter-prune wall shrubs: Shape evergreen shrubs, such as flowering quinces or pyracanthus, to keep them flat against a wall. Prune out any outward-facing shoots and those growing towards the wall. Remove unwanted stems at their point of origin. Space out the other shoots, pulling them down horizontally and tying them in. Prune back the longest stems by two or three buds to keep the shrub balanced. the glass is clean to let in plenty of light. Wait until later on in the winter to seeds of bedding plants and planter plants. Clear away snow: Don't let snow weigh down conifer branches. Brush it off immediately or tie the branches together with twine to preserve the plants shape. Limit frost damage: Firm in newly planted trees and shrubs loosened by frost. deciduous climbers and hedges: Hard prune old and congested shrubs while they are dormant. Mulch heavily afterwards. wall shrubs: Place fleece over climbers if very cold weather is forecast. In frost-free weather, prune dead, damaged and diseased branches. Cut back to healthy wood. 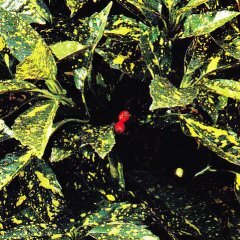 Cut out totally green or yellow reverted shoots on variegated evergreen shrubs. Prune deciduous trees whose long branches overhang herbaceous borders. Take root cuttings of clerodendrum, aralias and Rhus typhina. The larvae of crane flies can create unsightly brown patches in newly laid lawns. Deter the adults from laying eggs by double digging the soil to improve drainage. Set the mower blades at high, and mow only if growth demands it. Constant walking over a lawn during the winter when the soil is waterlogged causes compaction and impedes drainage. Avoid walking across the lawn by the same route every day. 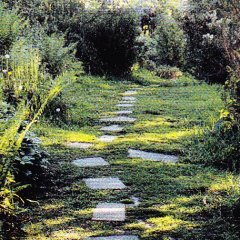 Alternatively, build sunken stepping stones or a path. Clean and oil all moveable parts before storing under a waterproof cover or in a shed. Empty the fuel tanks of petrol-driven lawnmowers. Protect ponds from freezing over: Place an inflated ball on the surface to absorb expansion that could damage pond walls. Place containers of boiling water on the surface of frozen ice to melt it slowly. In the north, lift and store swedes and turnips. In the south, where temperatures are milder, earth up the plants for protection. Clear away annual herbs from beds and planters. 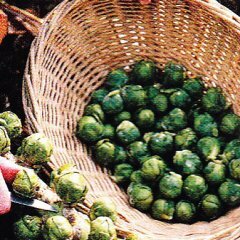 These include Brussels sprouts, winter cabbages, cauliflowers, leeks and parsnips. Protect Mediterranean herbs: In colder gardens, protect marjoram and rosemary with straw, leaf-mould or shredded forest bark. Feed all fruit trees: Top-dress wall-trained trees with well-rotted manure. Prune newly planted apple and pear trees: Reduce leading shoots by up to two-thirds. Winter maintenance: Finish tidying beds and borders. Check stored tubers. Firm the soil around plants loosened by frost Remove air pockets by firming the soil with your feet. 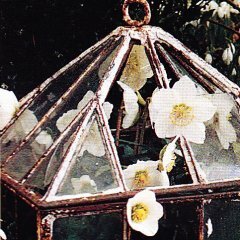 Encourage early flowering: Place cloches over Christmas roses to bring them on quickly. This will also protect the flowers from mud splashes. Create bushy seedlings: Pinch out the growing tips of sweet- pea seedlings when three pairs of leaves have developed. This will encourage further side shoots to grow. Protect winter baskets: Move hanging baskets into a Porch or greenhouse when severe frosts are forecast. Plant up early colour: Cram window boxes and planters with winter pansies and ornamental cabbages.